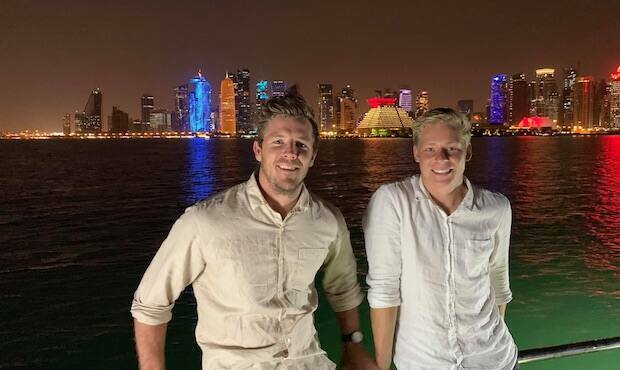 Luke Parker and Isaac Heeney upon the Dhow boat cruise around Doha, Qatar. A stunning display of buildings, architecture and lights helped create the stunning backdrop of night two of the club’s tour of Qatar. The contingent of Swans on the trip headed on a Dhow boat cruise to take in the sights of Doha by night from the best vantage point, in the water aboard a Dhow boat. During the two-hour boat cruise, players and staff took in the some of the most spectacular views of the skyscraper buildings and traditional architecture that make up the city of Doha. Departing from Dhow Harbour the eye-catching Museum of Islamic Art building is the first to catch the eye of those on board with its traditional look and feel lit up under the night sky. Swans players will return to the Park outside Museum of Islamic Art later in the trip to meet local Auskick players. As you head out into the Harbour the nightlife of Doha can be witnessed from aboard the boat with flashing lights crowning the hotel and business buildings. Players and staff enjoyed the scenery while having a magnificent dinner of local cuisine served up by the ever-helpful boat staff. After a busy day exploring world class facilities, the cruise was the perfect end to the night for the touring party in a chance to relax and enjoy the spectacular surrounds.